For later, OBD2-equipped, Jimnys I assume that ABS faults can be diagnosed with a cheap OBD reader and a compatible app/program. However, if the vehicle is pre-OBD2 (or you don’t have a reader to hand) you can check the wheel speed sensors directly by using a multimeter to check for the small voltages they send back to the ECU. The connectors for the two front wheel speed sensors are located behind the driver’s headlight assembly inside the engine bay. 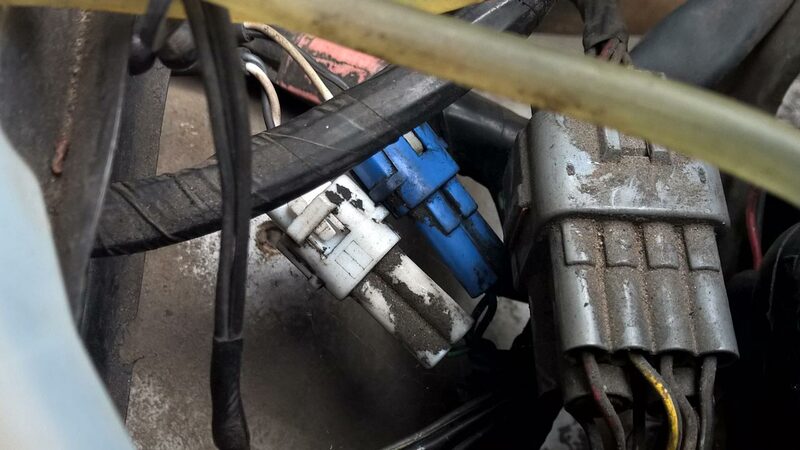 In my 1999 Jimny (and, I believe, the early G13B-engined UK models) the connectors look like the ones below; later models use a single square plug instead. To check the wheel speed sensor circuits jack the car up and spin each front wheel in turn whilst probing the sensor plug(s) with a multimeter set to DC volts. A working sensor will show a small voltage which increases with wheel speed, so a zero volt readout will show where the fault lies… just remember to go through all the wheel and plug combinations to eliminate user error! If both sensors look healthy the issue may be with the rear wheel speed sensor, which I assume (but don’t know!) can be checked in the same way. There’s no reset procedure necessary (at least on my pre-OBD2 JDMny) but the light won’t immediately go out after the swap – it takes a run down the road for the voltage to register and the light to go out by itself.